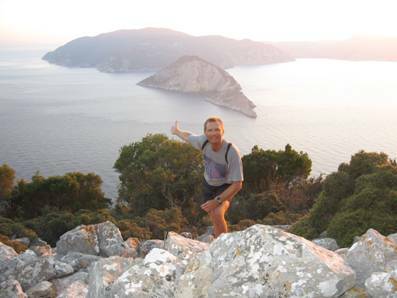 Each visit to Alonnisos at least one time I make it a point to make the hike up to Kalovoulo (see photo to your right and it’s located in the center just below the clouds), the highest peak on the southeast side of the island. 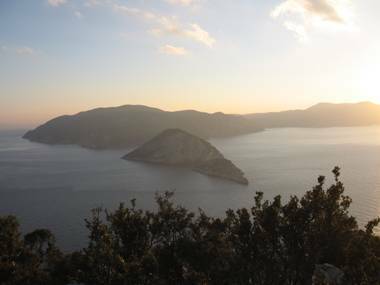 The view from up there is breathtaking as you can easily see the island of Skopelos, on a clear day mainland Greece in the distance, and a small islet very close to Alonnisos called “Agios Giorgos” along with the neighboring island of Skopelos (see photo to your left). 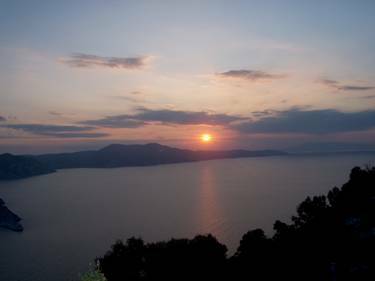 From that vantage point the beautiful Aegean Sea looks as still as a mountain lake, and if you arrive at evening time on a mostly clear night you’ll typically be able to witness a magnificent sunset (see photo below right). Kalovoulo is just to the west of the Old Village, and is reached via the use of a well-marked trail that can be accessed from a dirt road. To find this trail, follow the main tarmac road past the Old Village and just past the cemetery (on your right) make a left turn. From there just follow the road about a half a kilometer or less and then turn left again on a dirt road. Continue on that road perhaps 50 meters or so and on your right you’ll find the beginning of the trail. Just a few minutes into your hike you’ll find a fence with a gate that is kept closed to prohibit goats from leaving that area. The gate can be opened by removing a small wedged-in bar. Once you are inside the fence please be sure to reinstall the bar so the gate is securely closed again. 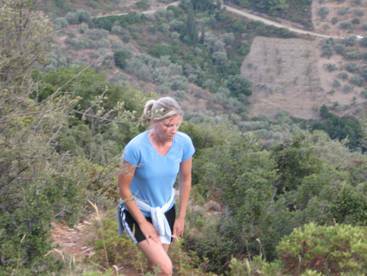 At that point the trail veers to your right and becomes quite steep (see photo of my wife Andrea to your left), so be prepared by wearing proper shoes (no flip-flop sandals!). Once you are past the first steep segment, the climb becomes a bit easier as you make your way through a fragrant pine forest. Always remember, however, to be cautious with your steps because there are loose rocks on the trail. 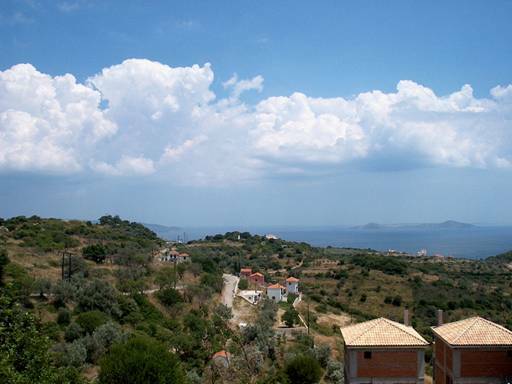 As you ascend you will have access to glorious views of the Old Village, the beaches at Micros and Megalos Mourtias, the island of Evia to the south, the Two Brothers islets to the east, and the island of Peristera as well. To see a YouTube video of the types of views you will see on this hike, click here. 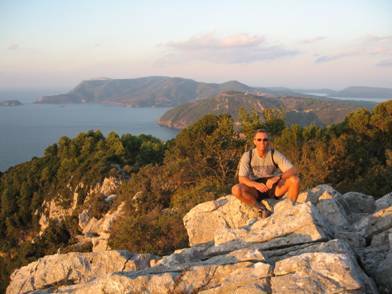 As you get further up the trail it becomes steeper again for perhaps 100 meters or more until you reach the first plateau (not the highest point though) where you can see clearly towards Skopelos and beyond (see photo to your right). While the altitude at this level is high enough to get great view to the west, if you’re interested in climbing higher to get an equally inspiring view back towards the Old Village it can be done, but there is no obvious marked trail to the actual summit. However, we have always found that other hikers have been conscientious enough to leave a series of stacked stones to mark one of the many paths you can take to reach the top. The reality is it’s perhaps just another 10 minutes to the summit, so I don’t want to leave the impression that it’s a long distance. However, because there is no prepared path you must be very careful when you climb this higher part of Kalovoulo, as there are numerous loose stones, and there are also very thorny bushes that would be very painful if you slipped and fell into them. Once you do reach the summit you’ll find a small cement pillar with an inscription in Greek to let you know you’ve indeed arrived there. On all our hikes we go a bit beyond the summit (i.e., a few steps further north) to find a clear spot that allows us to see all the way up island (see photo above left). The views are always very spectacular, and it’s also very peaceful up there. If you’re a fairly fit person and like to hike, I highly recommend you find time during your holiday to make this trip up to Kalovoulo – trust me, you won’t regret it. 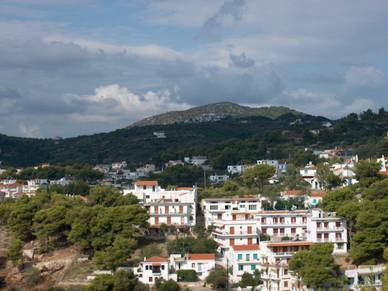 If your accommodations on Alonnisos are in either in Patitiri or the Old Village, as an alternative to mechanized transportation you can use the old “donkey path” to travel between these two locations. We have used it numerous times over the years, and of course the way DOWN from the Old Village is much easier than the way UP from Patitiri! In either direction the scenery is excellent throughout much of the walk, and if you’re a person who is older or not in the best of physical condition, in a couple of different spots there are benches to rest on. Depending on your fitness level, it will take perhaps 25 – 35 minutes to walk from the Old Village to Patitiri, and anywhere from 30 – 45 minutes to walk up. Although I don’t have any specific photos of the donkey path, the picture above shows where the path actually begins when coming from the Old Village. Specifically, if you look at the group of four houses in the center of the photo just to right of an ascending road (the road down to the beach at Megalo Mourtia), the path begins perhaps just 20 meters from the top of that road on the right side. For more complete details on the donkey path between Patitiri and the Old Village, click here.